Pennells in Lincoln is one of the oldest garden centres in the UK and it is turning to new renewable technology to power the business. The family-run business has invested £145,000 in more than 650 solar panels at its centre on Newark Road, South Hykeham and the project is due to be completed in the next few weeks. The project is being carried out by Freewatt, which is based in Stow – the birthplace of the very first Richard Pennell in 1735. The company’s first nursery was situated in Stow and then on the outskirts of Lincoln, next to a small stream called Gowt’s Beck, before moving to South Hykeham. Today, seven generations on, Lincoln Pennells is run by another Richard Pennell. Freewatt has brought in an expert from Belgium who has designed a bespoke fitting system, because of the unusual nature of the centre’s main roof. The system will generate 114MW of electricity a year and save 61 tonnes of CO2. The panels should save the company £11,500 in power bills annually and generate more than £12,500 in Feed in Tariff. Over 20 years, the 265W panels should generate more than £685,000 in savings and income for the garden centre. The system will pay for itself in around five years. 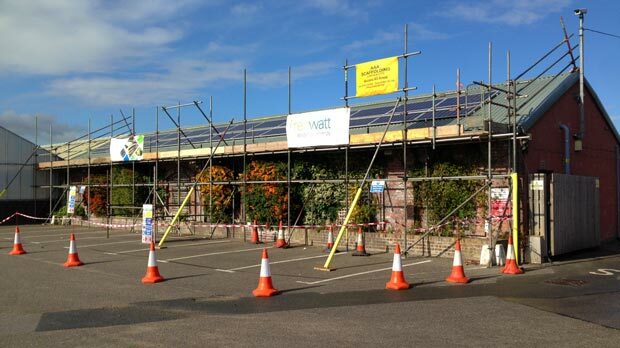 Renewable technology installation underway at Lincoln’s Pennells garden centre.